We've made it to September, and I still have summer nail polish to share with you. I know it's still technically summer, but once September hits I'm done with summer. The weather outside may not dictate that yet, but I'm moving on! Well, with the exception of some summer nail polishes....This one is from KBShimmer's recent summer collection. Pssst! Go check out some some blogs from yesterday to see KBShimmer's fall collection releasing soon. I'll have swatches of those for you next week! 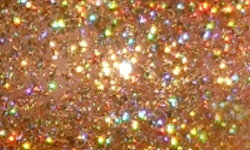 Sun & Games is a gold holographic micro glitter. Color: I am a big sucker for gold glitters, and even more so gold holographic glitters. Gold isn't the ideal color me, but I wear and love it anyways! This is a gorgeous yellow-toned gold and the bling factor is intense! Formula: This has a smooth and easy to apply formula. I used 3 coats here. You can still see a bit of my nail underneath in this photo, but in real life I cannot detect this at all. The sparkle is just so strong it's undetectable. Price: This is $8.75 on the KBShimmer website. Overall: This is a fantastic golden holo glitter bomb! The formula is great, and it is wonderfully sparkly!